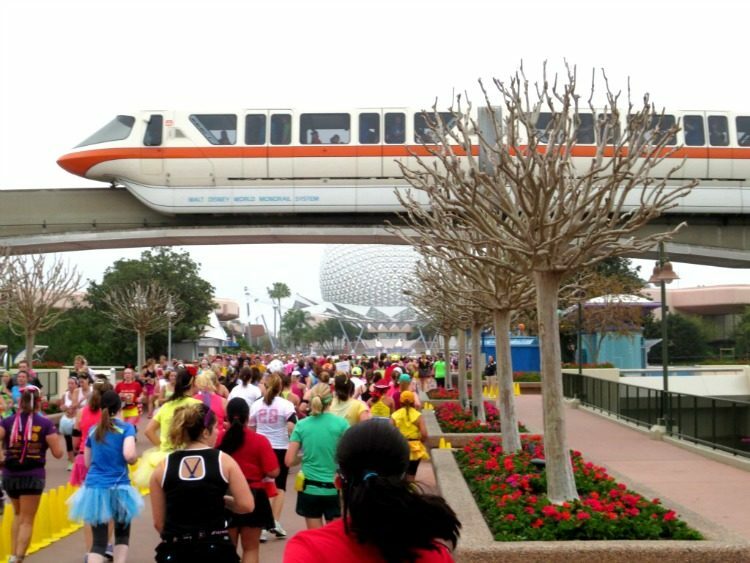 With all of the runDisney races now, it seems like race season is all year long. My first half marathon was a runDisney race, and I didn’t know what to expect. Whether it’s your first race or your 100th, 5K or marathon, it’s important to have good race etiquette so everyone can enjoy their race and be safe. 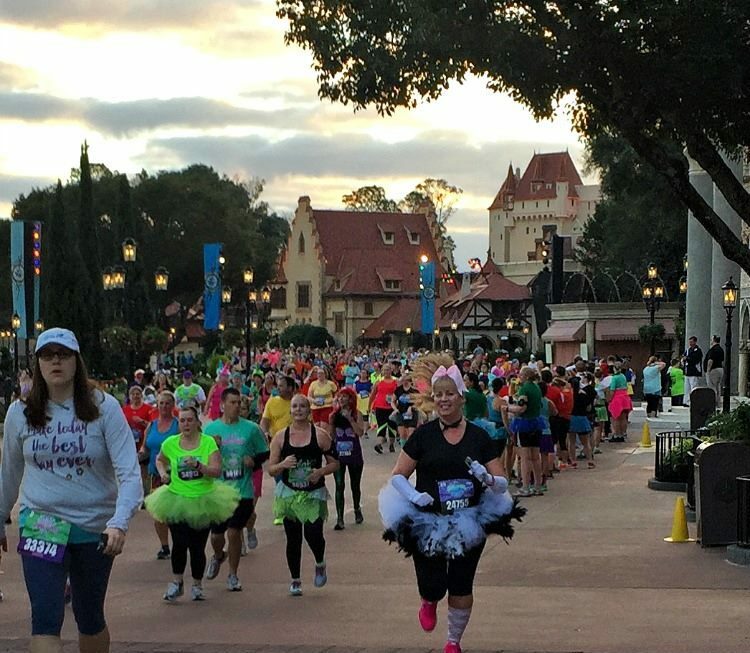 Here are 4 tips for runDisney race etiquette. I love runDisney races. They’ll always hold a place in my heart because it’s on Main Street, U.S.A. where I ran my first half and full marathon. They’re not perfect and often very crowded. 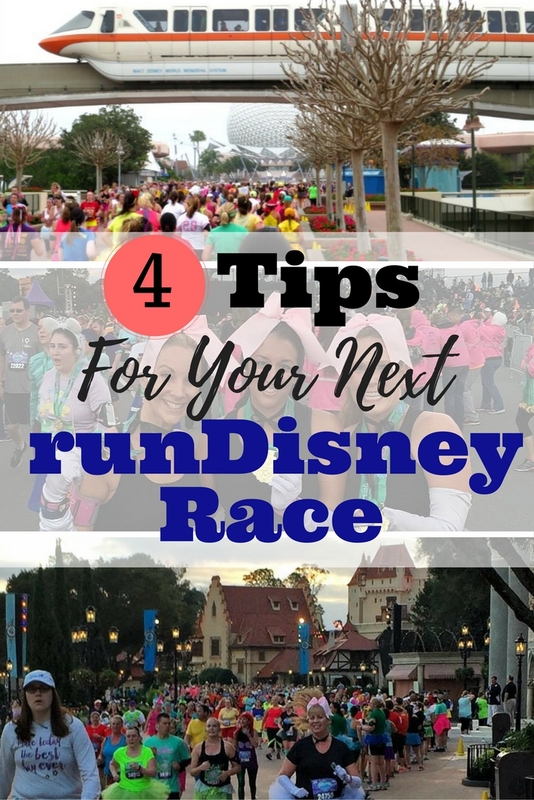 To help maneuver through the crowds, here are some tips to keep you singing Hakuna Matata through the race course. 1. Please start in your proper corral. I know we get all hung up on the letters and somehow it messes with our psyche. But if you submitted a proof of time, then you should have been placed with runners of your same pace. This is good..for everyone! That way you don’t start off too fast, and you don’t start too slow. Be honest about your placement. If you want to run with friends who may be faster, then don’t try to be a corral jumper. Have them drop back with you. The race will still be fun and everyone needs good race karma. Sometimes runDisney makes mistakes. Hopefully they’ll make it right if they do. If they don’t, well, I’ll leave that up to you. But that is no bueno, runDisney. so others can pass on the left if they need to. If people are running with other runners that have similar paces, then run/walkers can do their thing to the right, and runners can do their thing to the left. When people just throw caution to the wind, that’s when the congestion happens, resulting in participants trying to pass on the left and on the right. Weaving ensues, more accidental bumping occurs, and that’s when the curse words start flying. I really hate seeing fights and palabras being exchanged on the course. It just ruins la mágica for everyone. Sadly it happens, and it would be great if it didn’t. I’m looking at you, Princess Half Marathon. Extra good karma if you are a run/walker, and you signal either with a raise of the hand or yell “walking” when you start your walking interval. There are tons of Galloway runners in runDisney races, so sometimes the thousands of beeping watches gets confusing. And no disrespect from me for being a run/walker or having a beeping watch, because I’m one of them! 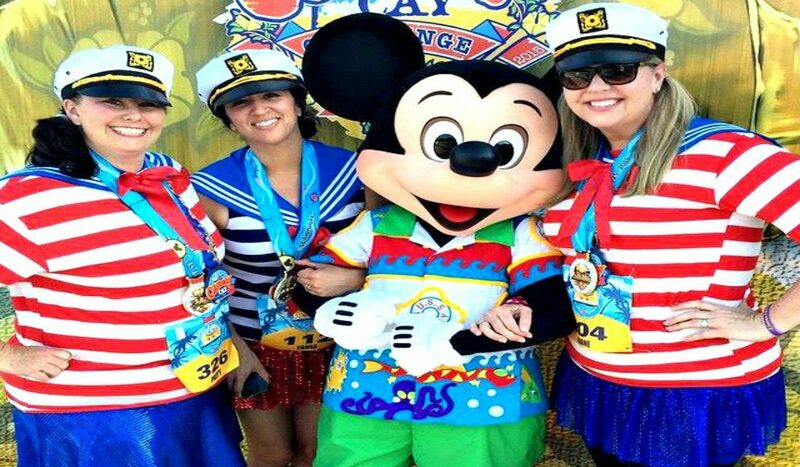 First time racers or first timers to runDisney races just might not be aware of it. 3. Try to run single file or two across at the most. I love running with my BRFs! In fact, it’s often more fun to run with friends. We laugh, we sweat, we run, we walk, we costume together. 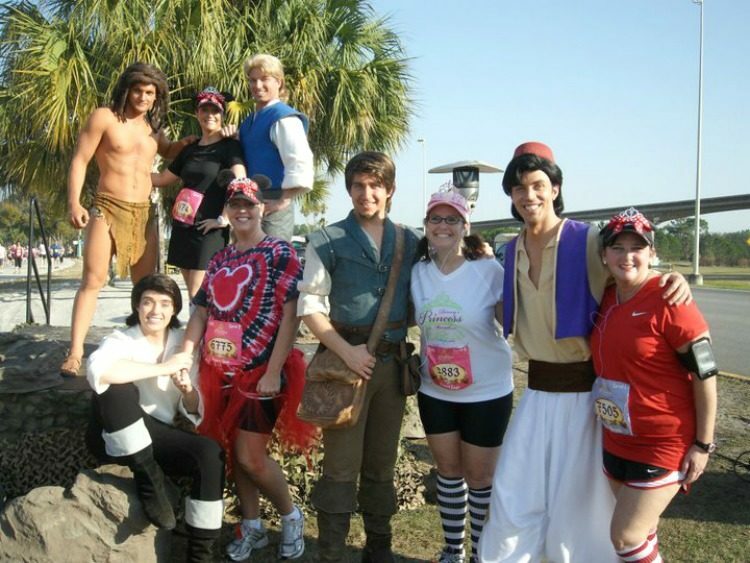 Yes, we dress in running costumes. We do not run more than two across though. That would just be plain mean. And I don’t want anyone singing Taylor Swift’s “Mean” to any of us. Because that would mean we were liars and pathetic, and no one wants that. 4. Throw your stuff to the sides. When I say stuff, I mean water cups, trash, extra layers of clothing, unwanted costume pieces, tutus, lo que sea. All unwanted clothing items will be picked up and donated later. I know we’re all in a hurry, but it takes maybe one extra second to throw a used water cup in the many trash cans along the side of the road or at least off the course. It can get slippery with all the water, and adding extra cups as an obstacle course is not fun. 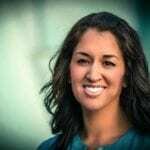 A lot of these issues may not happen if you’re in ‘A’ Corral and keep your pace. However, if you’re like me, and a middle-of-the-pack runner, then following these rules will help you have a better race and do a solid for amigos around you. 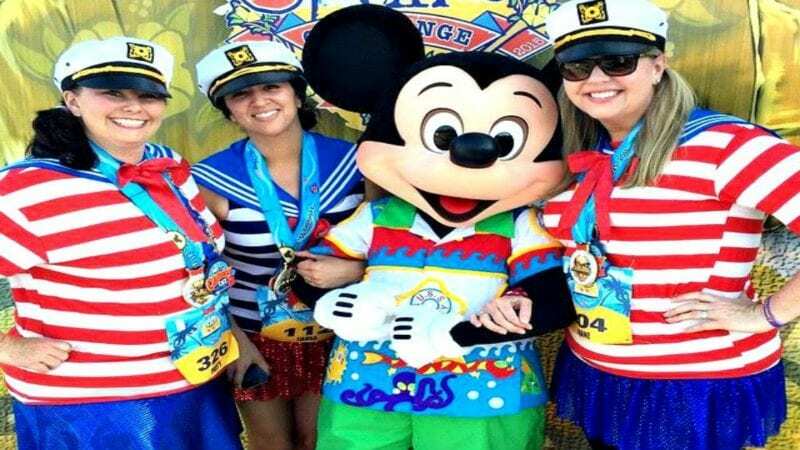 If you haven’t thought about running a runDisney race, you should. They are a lot of fun! Though I don’t run as many as I used to (because of cost), I still look forward to them. Hey, any excuse to go back to Disneyland and Walt Disney World. And you know what they say, every mile is magic.